This post brought to you by The Marzetti® Brand. The content and opinions expressed below are mine alone. 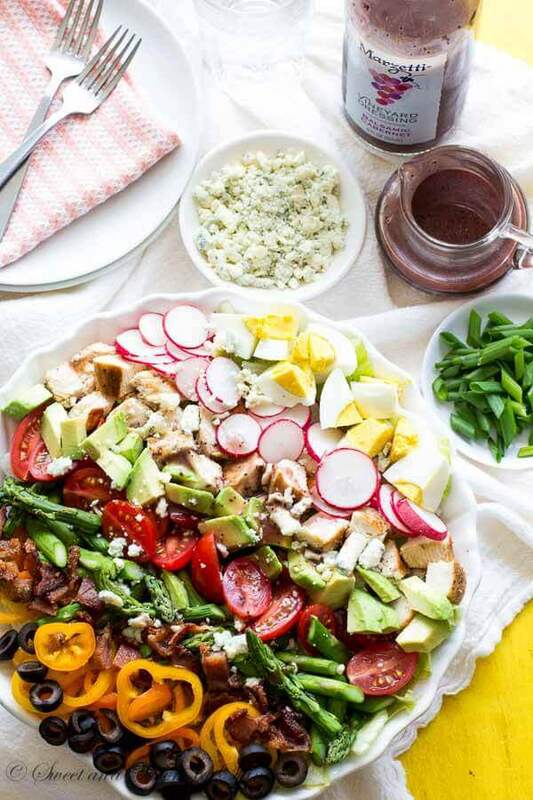 This spring version of classic cobb salad is bursting with tons of spring flavors and loaded with texture. 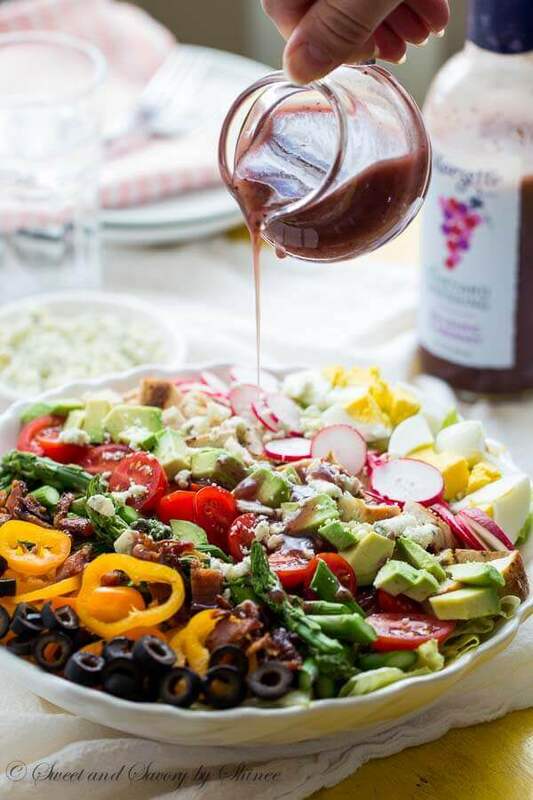 Tangy Marzetti® Vineyard Dressing in Balsamic Cabernet dressing ties everything together so you can enjoy the most satisfying salad ever! Holy smokes, you guys! Just look at this massive, loaded salad. Those vibrant colors… and imagine the various textures, from crispy bacon to juicy chicken, from crisp sweet peppers to creamy avocado, from crunchy radishes to soft asparagus, just to name a few! 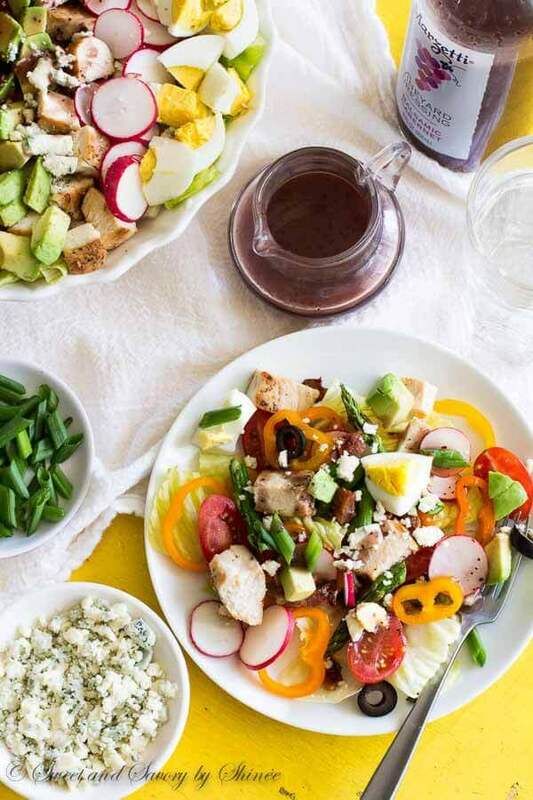 The very first time I tried Marzetti® Vineyard Dressing Balsamic Cabernet, I immediately thought of cobb salad because the classic version of this versatile garden salad is usually dressed with red wine vinaigrette. This unique dressing inspired by the vine is just what I needed to add that special zing to my gorgeous spring salad. 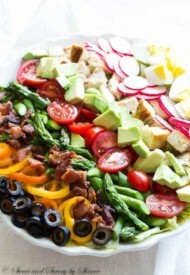 What I love most about cobb salad is that you can customize it to your own liking. Whatever which way you decide! Load it with everything you love, and/or whatever is in season. Salad doesn’t have to be boring. In fact, it should be exciting! My version here is just for inspiration! Be creative and focus on all the fresh produce YOU love, because the dressing is already taken care of for you. Let me show you my inspiration for this salad. Classic cobb salad starts with crisp lettuce (I’m using romaine lettuce here, but I also adore butter lettuce), tomatoes, avocado, and green onion. Other usual suspects are chicken–grilled is my favorite, bacon (yes! ), hard-boiled eggs and blue cheese. And to keep it in season, I added crisp and spicy radishes, asparagus and mini sweet peppers. Don’t they just scream SPRING??? The finishing touch: well-balanced, smooth and creamy dressing adds perfect tanginess and sweetness, that pairs beautifully with blue cheese and all the fresh veggies in the bowl. 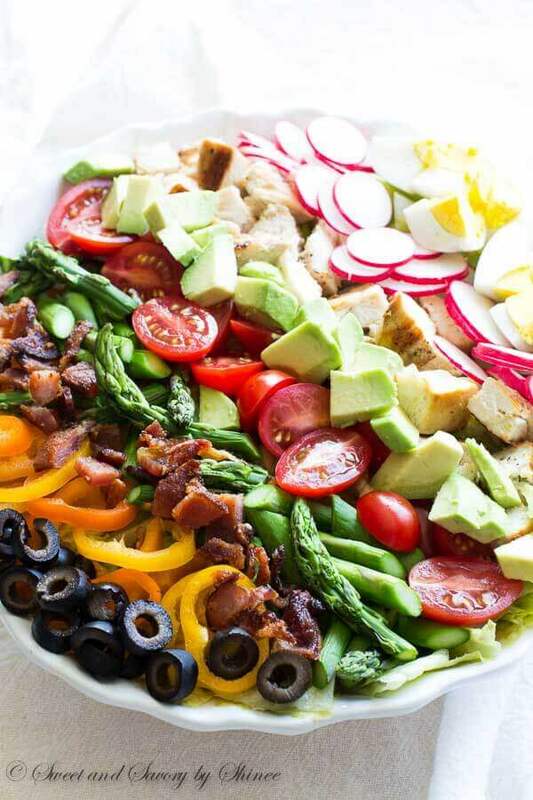 But wait, how in the world do you eat this cobb salad? Easy, take a large set of tongs and just dig in! I know it’s hard to break into such gorgeous salad, but trust me you don’t wanna just stare at it. Cook the bacon in a skillet and chop into small pieces. Slice the chicken breast horizontally into 2 thin fillets. Salt and pepper on all sides. Grill until cooked through. Then cut into small cubes. Cut the woody end of asparagus. Grill for a few minutes and cut into 2-inch pieces. Cut the romaine lettuce into bite-size pieces. Cut radishes into thin slices. Remove the seeds from sweet peppers and cut into thin slices. Chop the green portion of scallions diagonally. Peel and cut hard-boiled eggs into bite-size pieces. In a large bowl, spread the lettuce and then arrange all the prepared toppings in strips. Sprinkle blue cheese and scallions all over and pour the dressing.